Hundreds of supporters have signed up for an identification card scheme to stop hooliganism at Stoke City's away games. Fans without the cards will not be allowed into any of Stoke's away games, starting with the match at Grimsby on 8 February. The scheme was introduced after some First Division sides began imposing travelling restrictions on Stoke supporters as a result of a series of violent incidents. The club said the majority of applications for "True Supporters Cards" cards had come from families. Only two people out of the 1,500 who have requested cards have so far been rejected. Stoke City chief executive, Jonathan Fuller, said: "We are delighted with the response from fans. "By applying for a card they are backing our fight against the hooligans. "We would now strongly urge anyone who has not yet applied to do so because the two-week deadline is approaching." 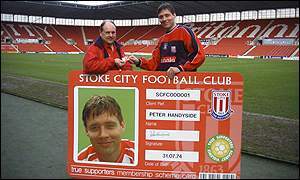 But the editor of Stoke City fanzine the Oatcake, Martin Smith, said the card scheme is punishing the majority of fans for the behaviour of a very small number. "Fans have been blackmailed into it. "It's not that you want to get a card - you've got to." The club said supporters who wanted identification cards in time to travel to the Grimsby game should apply for them by this weekend. Cards cost �10 for adults and �5 for juniors. 27 July 2002 - Stoke and Port Vale followers clashed outside a pub in Trent-Vale after a pre-season friendly. 10 August 2002 - About 500 hooligans damaged trams in Sheffield taking them to Hillsborough and become involved in violence outside the ground. 14 September 2002 - Troublemakers managed to enter Burnley's ground undetected and police had to use batons to deal with them. 16 November 2002 - About 250 hooligans were involved in violent clashes before and after Stoke's match with Portsmouth.